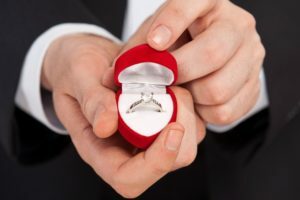 Close More Customer Conversations with 1 Basic Step - AutoNetTV Media, Inc.
By Sean Whiffen, CTO/CMO, AutoNetTV Media, Inc.
My body trembled as I anxiously got down on one knee and pulled the diamond ring out of my pocket. I had been planning and preparing for this moment for months, but the tension and excitement caused my mind to race in too many directions. Focus! Look her in the eyes. Show the ring. Ask the closing question. Yes! Let’s face it; I did a lot of work leading up to the big moment. Showing interest, building trust, proving my stability, communicating positive aspirations for the future, and a whole lot more. None of these steps can be skipped. But even if I forgot to ask the right question, the simple act of showing the ring completely conveys the entirety of the message. It’s a visual aid with no barriers of language or geography. An incredible amount of words and emotions with one simple object. Your business works hard to build relationships with current and prospective customers. It comes in the form of years in business, BBB ratings, certifications, positive reviews online, being involved in the community, and treating people well … like family. This is all your ground work leading up to the big moment. None of it can be skipped. But your big customer conversation moments come over and over again, with existing customers and with new ones. Even though you’ve established yourself, each new conversation is a new decision process for the customer. They weigh numerous considerations in a matter of seconds. So increase your success in these moments of truth by having a diamond ring to pull out of your pocket. Studies have shown that people 90% of all information we remember is based on visual communication. Facebook posts with a photo generate 53% more “Likes”, and 104% more comments, than posts with only text. And no, there is no popular website named YouTalk.com. Before any presentation of needed maintenance or repair services, have some visual aids to help your customers understand what you’re describing, and to help you convey the need without appearing to speak a foreign language. Many manufacturers provide parts, engine pieces, and other items to help you. AutoNetTV provides animations, videos, 3D objects, and images to help visually convey your message quickly and easily to a customer. AutoNetTV Drive provides easy methods for showing this content on demand via a remote control, on your website, on a tablet, or via email. Using these proven tools builds deeper relationships and will increase your closing ratio.